Posted on February 24, 2015 by No Map Required Posted in Peru, Places	. Note: the really big day is Day 3 and we have a zillion pictures. This post is a prelude to the big show! That being said, I want you to think about shopping in a mall the week of Halloween. Hints of green and red have already appeared and every few songs the musak people toss in Bing Cosby crooning about a White Christmas, and lots of people including this author, give it a big eye roll because you KNOW you are going to hear White Christmas, Little Drummer Boy – parumpapapa pa – and Rudolph about 15,000 more times before Christmas. Turns out Carnaval has its own soundtrack as well, but sadly it’s one, and only one, song. At least here in Peru – can’t say in other places. Anyway, it’s a little courting tune that is played by every single band in the parade. We heard it yesterday during the paint-a-thon and again in today’s parade – just louder and with even more gusto. You hear it on the radio by one artist after another. It’s apparently okay to play it six times in a row. It’s sung by kids having fun and drunks in bars or at the side of the road. I-can-not-get-it-out-of-my-head…which is extra tough since I don’t even know the words! Imagine that the week of Christmas all you hear ANYWHERE is Little Drummer Boy and ONLY Little Drummer Boy – parumpapapapom rumpapa pa prrrum prrrrum prrrrrum…. For day after day you cannot turn on the radio, TV, go to a show, parade, bar, restaraunt without the parumpapappas. This is Carnaval! Today was the first big parade of Carnaval. 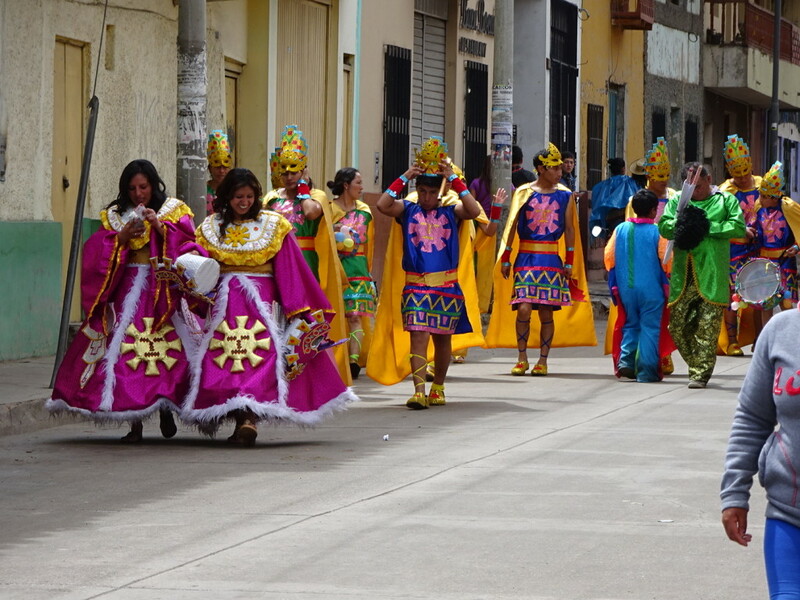 We did not get up or out of the house too early, knowing from our experience at the holiday parades in Ecuador that parades in South America go on for hours and hours….and still more hours. When we did make it to the main square the place was packed – so much that we couldn’t even see the parade! We wandered around multiple blocks and eventually started to catch a peek. 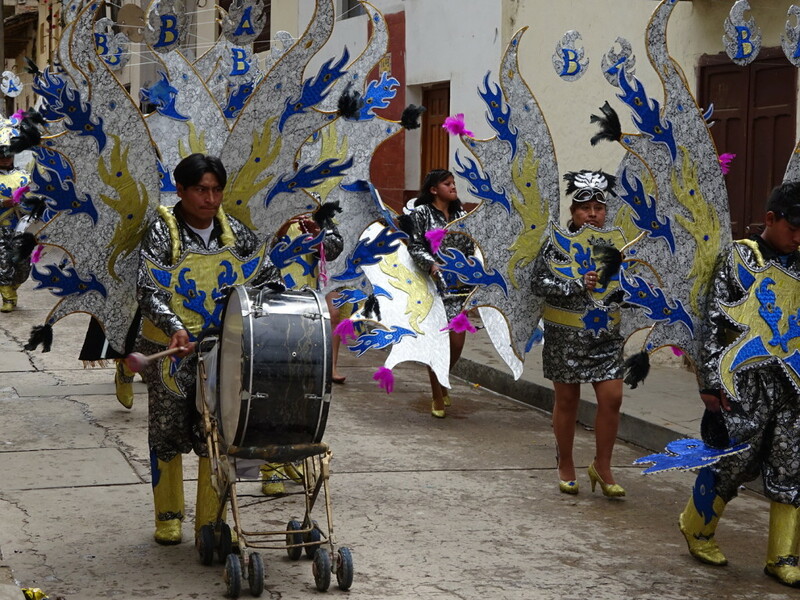 People in all sorts of brightly colored costumes and a band with every group – playing the Carnaval Song. 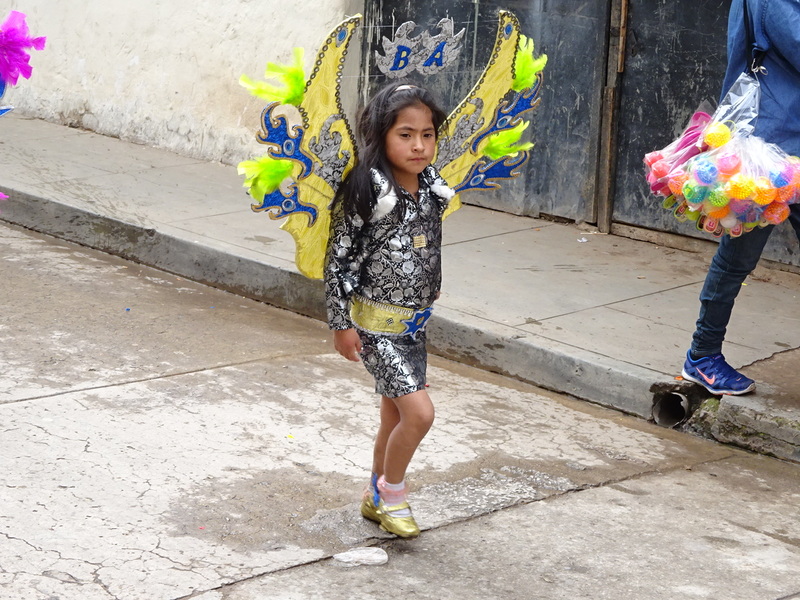 Once again, we would occasionally make eye contact with someone who would shoot us a big smile because we don’t think many Gringos make it here to join in the fun of Carnaval. We kept jostling for position, but it’s hard to get a good view so finally we gave in and just went to lunch. Strollers are a rare sight in South America as babies and kids are carried on their parents’ backs or in their arms. “Sidewalks” have steps, holes, and trash in them. Turns out, strollers just don’t make sense for babies…but they’re perfect for carrying drums during the parade! Lots of little itty bitty cutie patooties are in the parades. Check out his fancy Goofy shoes. We had lunch at a little hole-in-the-wall nearby. We ordered ‘menu of the day’ which is always the cheapest option (about $4 total for the two of us). First course is soup (sopa!) of course. Basically it was chicken-and-rice soup. Mine came with something like an organ in it – maybe a tongue of something. Aaron’s though, Aaron was the big winner – he got an actually chicken foot! I’ve seen them sold everywhere, but this is the first time it showed up in a form we recognized. No doubt someone has slipped us chicken foot at some point, but we were none the wiser. No, he didn’t try it. 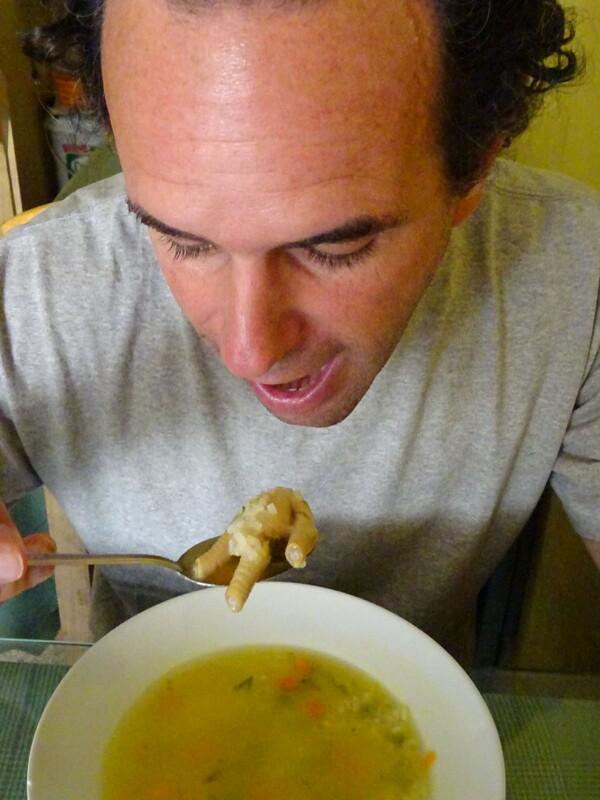 Anyone out there now how to eat chicken feet? We didn’t know where to begin so we ate around it and waited for the second course (‘menu of the day’ generally consists of a soup, a main course of your choice among 2-5ish options and a juice. Sometimes also a dessert, but usually not). As we headed home in the rain, we zigzagged through town, occasionally consulting our map. At one intersection an older man noticed us in the rain with our map and insisted we come inside his shop and sit with him so we don’t catch the “gripa” (the flu). It was hard to say no, so in we went. Adolpho turned out to be a tailor and we sat amongst half-sewn garments and bolts of wool. He makes suits mostly. 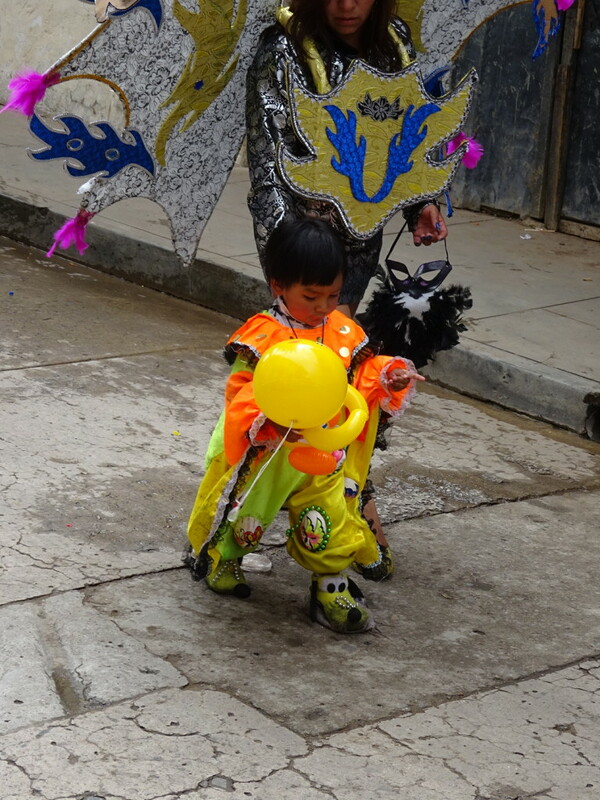 Aaron conversed with him as best he could while Adolpho turned on the TV (hidden behind the sewing machine and various bolts of fabric) – it was playing the Carnaval Song of course and showing the parade in progress. Then he brought out a bottle of moonshine (“aguardiente”) and really wanted us to try it. I was hoping it would be pisco because that’s the reason I came to Peru. Aaron came for textiles and ruins and ancient history… I came on the quest for an authentic Pisco Sour. When he passed the bottle to me I was fully intending to take a swig. No faster way to make friends than to try the local drink of choice! One whiff of that stuff, though, and I immediately claimed I don’t drink either, since Aaron had so nicely laid that groundwork moments earlier. It was something like a strong (um, light-it-on-fire-strong) alcohol smell combined with rotting fruit or rotting meat or something just gawd-awful rotting. My keen survival instincts kicked in and I vigorously shook my head “no” and started to hum along with the Carnaval Song. Tomorrow we hit yet another parade, the main one, but this time we have tickets for the covered grandstand which should give us a great view AND protect us from the rain. I sure hope so as I hear it’ll be 6 hours long! Bring on more Carnaval!!! Another young performer. To be in the parade, you have to commit to the rehearsals – all the singing and dancing, AND to make the costume. I think the latter sounds like the hardest part of the deal. You will only get rain coats here with Internet access! And we were not able to find them in kids sizes. So Seattle is not this much different to Peru! Have you tried the big REI downtown? I (Aaron) used to work there and I know they have kids raincoats upstairs. A side business? Set up a small business, buy fabric wholesale and send it to him to make rain gear. Maybe introduce him to Gortex and coated Ripstop. Not London Fog, but a whole trend maybe. You get a percentage, but don’t get rich. Speaking of fabrics, I love those costumes, but then I’m a fabriholic. Just wait until our Day 3 post – you’ll see costumes like you wouldn’t believe! And we did find raincoats around later (there was actually a North Face store in the mall! ), but not the fabric alone.